The electron transport chain is the main source of ATP production in the body and as such is vital for life. The previous stages of respiration generate electron carrier molecules, such as NADH, to be used in the electron transport chain. Clinically, some molecules can interfere with the electron transport chain, which can be life threatening due to its importance and these are discussed in detail later. The electron transport chain is located in the mitochondria. There are five main protein complexes in the electron transport chain, located in the inner membrane of the mitochondria. These are labelled Complexes I, II, III, IV and V. The two electron carriers, NADH and FADH2, begin the chain by donating their electrons to Complex I and Complex II respectively. These electrons are then passed to the next complex in the chain. This generates energy which is used to pump hydrogen ions into the intermembrane space. In doing so, a proton motive force is generated. This is an electrical and chemical gradient of hydrogen ions between the intermembrane space and the matrix. The main route back into the matrix is through ATP synthase. This is key for both pathological and physiological processes, and is discussed in Uncoupling. Complex V, or ATP synthase, allows the proton motive force to be discharged. This enables the energy of hydrogen ions diffusing back into the matrix via Complex V to be harnessed, thereby creating ATP from ADP. When the concentration of ATP rises, there is less ADP for ATP synthase to use. Therefore, there is a natural limitation in periods of high respiration to avoid large amounts of ATP from being produced. Conversely, when the concentration of ADP is high, there is a lot of ADP for ATP synthase to use and so more ATP is made. The electrons, meanwhile, combine with the hydrogen ions and oxygen to form water by Complex IV. However, this process is not perfect. Electrons can leak out of electron transport chain and can reduce oxygen, which can produce free radicals such as superoxide and hydrogen peroxide. 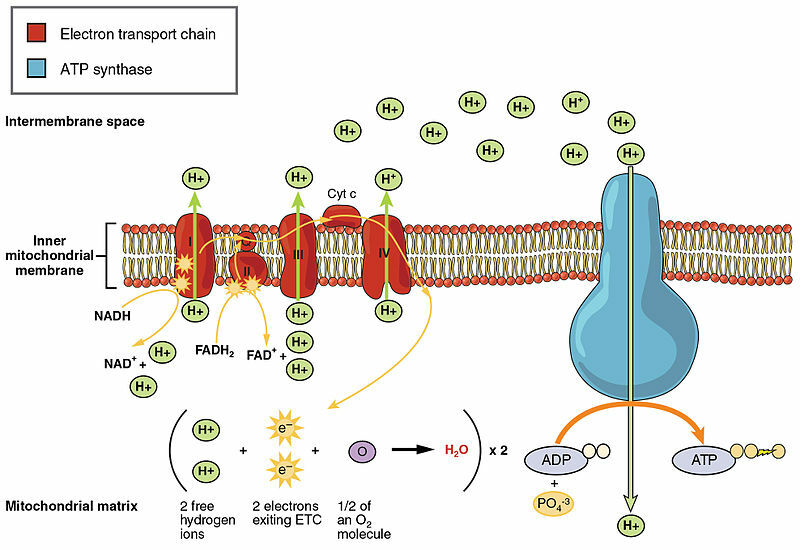 Fig 1 – Diagram to summarise the electron transport chain. Uncoupling proteins provide an alternative route into the matrix through the membrane, and causes less ATP formation. This is due to reduced gradient between the matrix and the intermembrane space. Therefore, there is less ATP formed, and more heat generated. Physiologically, thermogenin is an uncoupling protein found in brown adipose tissue which allows protons to flow from the intermembrane space into the matrix to generate heat in response to cold. Uncoupling can also occur pathologically. In contrast to uncoupling proteins, these chemicals increase the permeability of the inner mitochondrial membrane to protons without a need of a protein. This is seen in 2,4-dinitrophenol poisoning, where the membrane becomes more permeable to protons. This results in overheating as the protons diffuse through the membrane and not through ATP Synthase. This is also seen in Salicylate, which is a by-product of aspirin poisoning. This allows protons to diffuse through the membrane producing heat and less ATP production. By inhibiting a protein in the sequence, the proteins can’t use the energy of the electrons to pump hydrogen ions, and so the chain can’t function. Examples include cyanide and carbon monoxide which inhibit the final electron acceptor. This means that all complexes before that remain with an electron, and so there is no passing of electrons down the chain and no proton motive force established. Therefore, there is minimal ATP production. Where is the electron transport chain located? Which of the following generates the proton motive force? Through which complex does H+ return back into the matrix? What is the function of thermogenin physiologically? How does cyanide inhibit the electron transport chain?